. 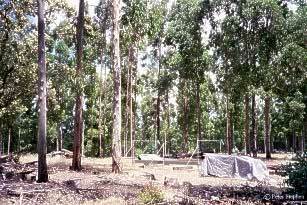 : Farm Forest Line - Comparison of treatments and testing new ideas:. Most formal farm forestry trials involve the testing of hypotheses or the comparison of alternative treatments. A carefully prepared experimental design reduces natural variability and allows statistical analysis to test for any significant difference between treatments. To be credible, a number of replications of each treatment need to be incorporated to account for natural variability. The replicates, or plots, may vary in size from just one tree to many hectares depending on the treatments being tested. For example, single tree plots might be used to test for genetic variability within a species whereas small area plots are commonly used in establishment trials testing fertiliser, weed control and soil preparation options. 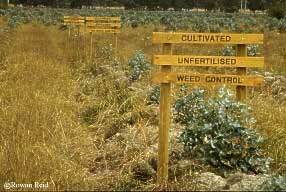 Large plots are required to test silvicultural options and agricultural productivity. Replicated trials can be very complicated to design, manage, measure and interpret. However, farmers can use scientifically valid methods to undertake simple and inexpensive tests. The key is to minimise the number of treatments and the variability across the trial site so that any observations can be legitimately related to the treatment. For example, to determine if there is any advantage in ripping before planting a farmer could establish a replicated trial and monitor tree growth over the following years. By plotting the results they can judge whether the treatment is worthwhile or even undertake a statistical analysis to test for significant differences between the treatments. The treatment plots should be carefully located and protected from anything that may have an uneven effect across the site. To avoid any outside influence or edge effect a buffer, treated in the same way as the plot, might also be required. One interesting trial design commonly used in agroforestry and farm forestry research is the variable spacing trial. Conventional spacing trials require a very large area of land because each plot containing a particular tree spacing option needs a large buffer to minimise the edge effect. Variable spacing trials simply involve a gradation from a high tree stocking down to a low stocking across a uniform site. See Silviculture. Complex equations are available to help determine the effective stocking rate of each row of trees. The designs can be set out as parallel lines or like spokes of a wheel (Nelder). To be statistically valid there must be at least 7 trees at each stocking and the entire trial should be replicated at least three times. It is critical that there is a well-grown tree at every point of the design. Although not strictly valid, a single trial is useful to demonstrate the effect of spacing on tree growth and pasture production. Farm Foresters have a reputation for trying out new ideas or working to improve old ones. Testing new or alternative species, management options, equipment, pruning techniques, and potential forest products in a small way, without risking large amount of money or time, provides valuable information prior to a large investment being made. Farmers commonly share their experiences with others, thereby helping them deal with similar problems/issues. Many farmers have also taken to adapting existing agricultural equipment or building their own new tools for the establishment, management or harvesting of their forests. Direct seeders, planting machines, pruning tools and other farm inventions are commonly seen at field days. Some of the better ones go on to be commercially produced. Being part of a regional farm forestry network or grower group is the best way to gather ideas from others. Local newsletters, meetings, field days and seminars provide growers with the opportunity to share ideas and discuss strategies for regional initiatives. Magazines such as Australian Forest Growers and Agroforestry News include many articles about farmer experiences and innovations.